I really like this bunny, as it is a great one for all age groups ? even the littlest amongst us. My three-year-old son loves painting and sticking things, but isn?t so good at drawing or painting details. You get to paint a little and stick lots! 1. 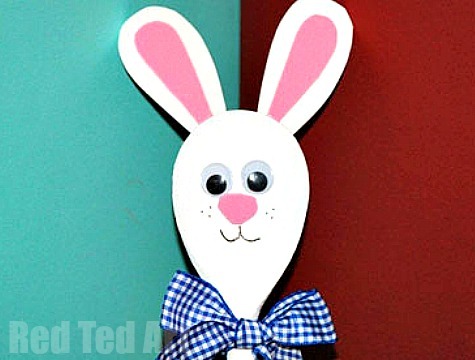 Paint the wooden spoon white or brown (in fact, there is nothing stopping you from making blue or red bunnies ? your choice). Let dry. It is handy if you don?t paint the whole of the spoon handle, as you can then prop it up in a cup to let it dry. 4. Add detail ? mouth and freckles or whiskers.